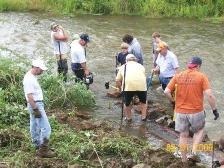 Thanks to Kelly Williams from the Clearfield County Conservation District for bringing new people to help out, and thanks to Steve Kepler of PFBC for his technical guidance. 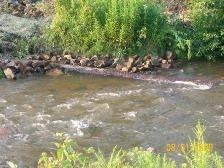 We want to extend the fish habitat improvement project downstream in the flood control. We think this will not only increase recreational opportunities, but will also remove silt and eliminate the need and cost of dredging. Naturally, any design in the flood control needs the approval of the Army Corps of Engineers. The Army Corps of Engineers requested a hydraulic study be done to ensure that the habitat work won’t adversely affect the protection provided by the flood control. We are currently looking for funding to do the hydraulic study.